We will Create 40 Backlinks from High Domain Authority and High Page Authority Sites, These backlinks are known as profile backlinks. All Backlinks are 100% unique and Safe and Will reliable on the web, we use only high authority sites becuase only they can boost your sites, Most of the backlinks will be dofollow but Nofollow will be there to balance the Links package, You will get Only URL and Anchored Backlinks both in a combination, Some sites allows anchor and html code links somes doesnt, we will respect the site admins. So.cial signals and SEO - Increased social signals indicate good domain authority and demonstrate a URL's value. When large numbers of users share and like a page, it indicates that the page is genuine and contains substantive or entertaining content. So.cial Signals for SEO is nothing but Google crawls Your Facebook, Twitter and Google Plus Pages links. ( including All Social sites but these three are important). Social signals legally driving traffic from multiple social networking sites like google plus, facebook and twitter. We Will Provide XLS Report of all links in the end. We are professional SEO Team Trying to add value to your life. 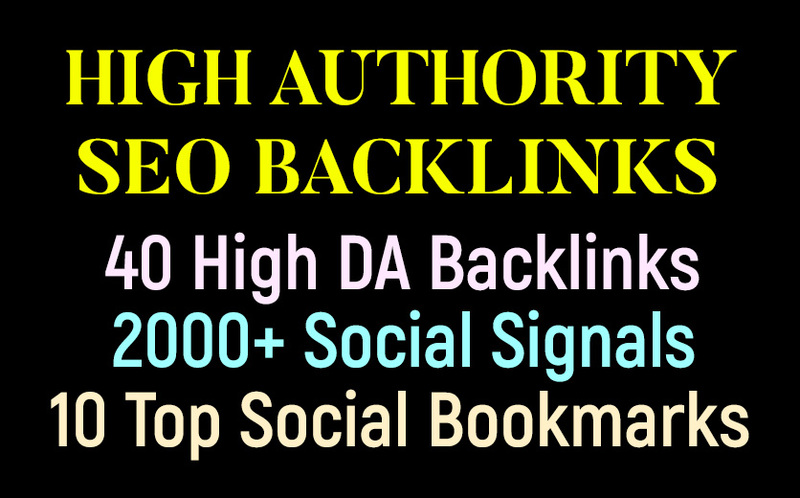 40 High DA Backlinks, 2000+ SEO Signals, 10 Top Social Bookmarking - High Authority seo Backlinks is ranked 5 out of 5. Based on 1 user reviews.